This is a great gift choice for the theologian or history buff in your life. I've long been fascinated with World War 2 history and am familiar with Dietrich Bonhoeffer. 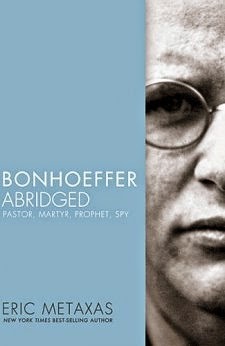 Having not finished the unabridged edition, I jumped at the chance to review "Bonhoeffer Abridged: Pastor, Martyr, Prophet, Spy, " by Eric Metaxas. This edition is very readable - unlike many abridged books. "Bonhoeffer is a story of moral courage in the face of .. monstrous..... (Bonhoeffer) became one of the first to speak out against Hitler. As a double-agent, he joined the plot to assassinate the Führer, and was hanged in Flossenberg concentration camp at age 39. Since his death, Bonhoeffer has grown to be one of the most fascinating, complex figures of the 20th century." This story moved me. I have long asked, "Where was the German church when Hitler rose to power?" Metaxas answers that question well while illustrating the life of Bonhoeffer. I was forced to consider the role Allied Politicians had in NOT supporting those trying to over-throw Hitler. We wanted to believe, "There is no such thing as a good German." Dietrich Bonhoeffer disproved this notion. I found it fascinating to read about this time period from the German point of view. This book has it all - theology, tough questions and answers, moral dilemmas, intrigue, an amazing amount of new facts to digest and even a bit of unexpected romance. I highly recommend it to history buffs, theologians, Christians who wrestle with the role of faith in social/political issues, high school students studying World War 2....you won't regret this read.